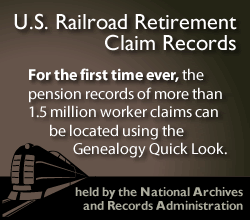 Genealogy Quick Look provides an index to a portion of resources available through the Midwest Genealogy Center as well as inactive pension claims from the U.S. Railroad Retirement Board. Search the index by name and/or date. If you locate a resource, you will have an opportunity to request it from the source organization.